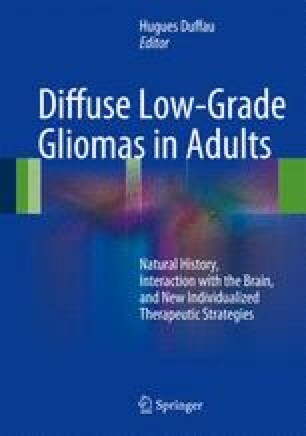 Although initially silent, diffuse low-grade gliomas (DLGGs) always progress into a more aggressive pathology, eventually causing death of the patient. Their diffusive nature makes them difficult to fully remove by the surgical approach. Understanding the molecular pathways ruling DLGG dissemination would open up new lines of treatments aiming at limiting their spread throughout the brain. However, the rare occurrence of these tumors, the difficulties in growing them in culture, and the quasi-absence of DLGG-derived cell lines have definitely impeded the progress of knowledge on this topic. This explains the very few data available today on DLGG invasion and calls for more efforts from the scientific community to tackle this complex challenge. Here after reporting the main studies which have approached the problematic of DLGG dissemination, we propose some analogies with oligodendrocyte precursor migration and suggest some promising directions to take. We then raise central issues making DLGG dissemination difficult to study with our present state of knowledge and technical possibilities. Deciphering the migratory strategies adopted by DLGG to invade the brain would be a major advance for the development of therapies aiming at maintaining DLGG in a confined and resectable nutshell.